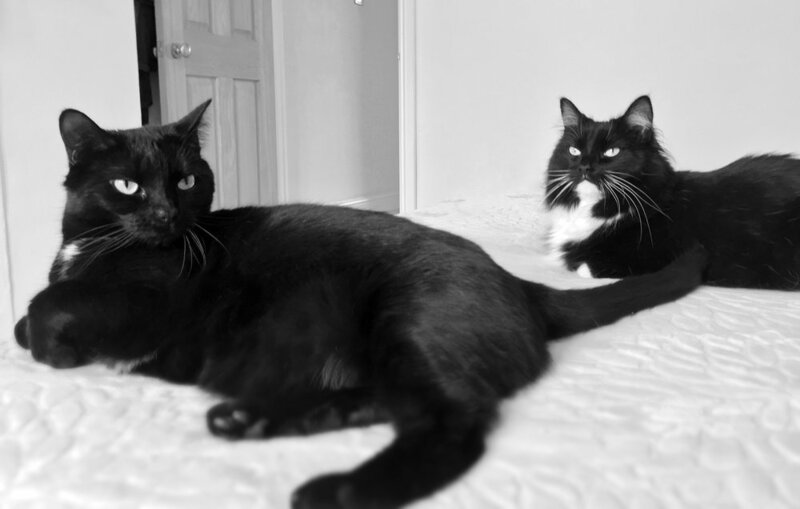 Meet Nancy & Pickle, rescue cats and sisters – the inspiration for Pickle and Nancy cards! Pickle and Nancy are sister black and white rescue cats that we rehomed in early 2016. They arrived with us via the RSPCA after almost a year in foster care. Now they rule the roost, and have settled in well at their forever home. Nancy, the quieter of the two, is more self-sufficient; Pickle, on the other hand, is more curious and has become a bit of a lap cat. After all they have been through they are still very close, and are often found curled up together. As cat lovers, and inspired by our two girls, we have designed a series of products including greeting cards and gift items and are making these available through Amazon and Etsy. For a bit of animated cat fun we have also produced a series of animated stickers for the iPhone.